4 Facts About Game Stars Platform That Makes You Professional Cyber Sportsman | Nerd Much? The popularity of eSports is gaining momentum. Play and earn. What can be easier? In fact, in order to get a chance at least to participate in the battle for a million prize, professional gamers must have non-stop trainings. Unlike traditional sportsmen who have a constant salary, cyber sportsmen are completely dependent on the outcome of the tournament. Failure to take the top position can lead gamers to slump out of the game. Lack of money for paying tournament fees, purchasing equipment and other problems of eSports deprive gamers of the opportunity to develop, while the industry loses real talents. What Problems Do Cyber Sportsmen Face? Existing eSports infrastructure make it almost impossible for new players to enter the market: tournament fees are expensive, there are no playgrounds where gamers can find sponsor etc. South Korean and Chinese markets are centers of eSports. Lee Sang-hyeok, aka Faker, is a famous player that joined SK Telecom team at the age of 17 and led it to win their first League of Legends World Championship. Wang Jiao, aka Banana, is one of the richest cyber sportsmen. He has earned $1.2 million in 38 Dota tournaments. These gamers have worked a lot on their results and could have done even more if market infrastructure has been developed by the time they’ve started careers. How to Solve the Problems of eSports? Players can raise funding by selling personal coins through a procedure called CICO. Raised money can be spent on the equipment, participation fees, coaches and more. 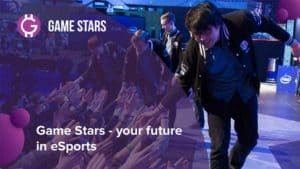 Game Stars team has launched a separate website for gamers where players can register and find sponsors. Project’s Token Sale has already gone live. Visit the official website to find out more about the platform. Subscribe to accounts on Facebook, Telegram, Telegram chat.